Let’s see the Throat Chakra meaning.. 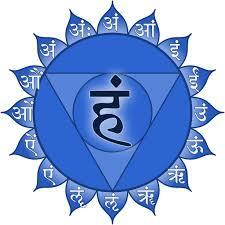 The Throat Chakra or the 5th Chakra’s original name is the Visshudhi Chakra. It is named as the Throat Chakra because of its location in the throat area. Visshudhi is a Sanskrit term which means PURIFIED, TO CLEAN , TO PURIFY, SUBLIMATE. It is a combination of two words Vish (Poison) and Shuddhi (To Purify), so Visshudhi is a place where even poison or poisonous elements can be purified. We go through many experiences in life that’s more bitter than death, but this bitterness turns into pious nectar or Ambrosia, by virtue of the Visshudhi Chakra. We can say that it is a center of purification. The Visshudhi Chakra is located in the neck and throat area, at the 3rd Cervical Vertebrae. The color of the Visshudhi Chakra is light blue, having 16 petals, each one of which inscribed with 16 syllabus depicting 16 vrittis,a downward triangle and a circular region like the full moon. This represents the element of Akash or Ether. Beej mantra basically is the vibrations, there are different Beej mantras for different deities. The Beej Mantra is a one-syllable mantra, when recited activate the energy to purify and balance the mind and body. 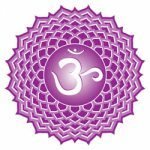 Hum is the Beej Mantra for the Visshudhi Chakra. Visshudhi Chakra mainly related to purification as well as communication and expression. When this chakra is underactive, one is unable to express himself, whereas an overactive throat chakra symptoms can be seen as an over opinionated person, can verbally abusive as well as very critical of others. Related physical organs are Thyroid and parathyroid gland, vocal cord, esophagus, trachea, cervical vertebrae, and shoulders. So any imbalance in this chakra can be reflected as physical symptoms in said glands and organs like dental problems, hoarseness, thyroid problem , neck pain etc. The visshudhi Chakra is situated in the neck and throat area. A neck is a connection between the heart and the brain. The brain and the heart are very vital electrical centers. Any imbalance in this Chakra very quickly relates more physical and emotional problems. Social anxiety, fear of speaking, shyness can be the symptoms on an emotional level where a person can not speak his truth. Yog Sadhana : Shoulder stand Asanas are particularly helpful in balancing the Visshudhi Chakra namely Sarvangasana, Halasana, Viparit Karni Mudra, Kandharasana, Ustrasana. Ujjayi pranayama, Jalandhar Bandh, Simha Mudra and Khechari Mudra has a significant effect on balancing the Visshudhi Chakra. Mantra therapy : The Beej Mantra is HUM for the Visshudhi Chakra. Sound Therapy : Note G / 384 Hz. color Therapy : The Color of the Visshudhi Chakra is Sky Blue or Light Blue, so wearing blue, having in your surrounding can be of great healing remedy. you can use Blue in your wardrobe, can wear Blue Crystal jewelry, for the remedial use. Nourishment : Having juices and soups in your diet, drinking a lot of water, fruits like blueberries, blackberries, cherries, grapes, can be of great help. Crystal Therapy : Blue Sapphire, Lapis Lazuli, Aquamarine, Turquoise, blue Calcite, Blue Kyanite, Blue tourmaline are the best for the Visshudhi Chakra. Aromatherapy : Essential oils such as Lavender, Geranium, Coriander, Chamomile, Lemongrass can be effectively used for balancing the Chakra. Affirmations : I speak freely and with confidence. Element : the element of the Visshudhi Chakra is Akasha or Ether, so walking, speaking your mind , singing can be of great help. The Visshudhi Chakra is the Center of Communication, sound and creative expression, the importance of these things is widely acclaimed. Balanced Visshudhi Chakra is much needed in today’s world. You can use some of the following things to balance your throat chakra. What is the Sacral Chakra ? What is the Third Chakra ? 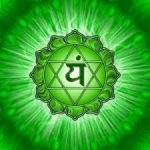 What is the Anahata Chakra ?